Why not “The Top 10 Reasons to Attend UX Fest”? Because I already wrote the top 3 reasons to attend, and I stand by that. But I needed to tell you more, so this was my excuse. 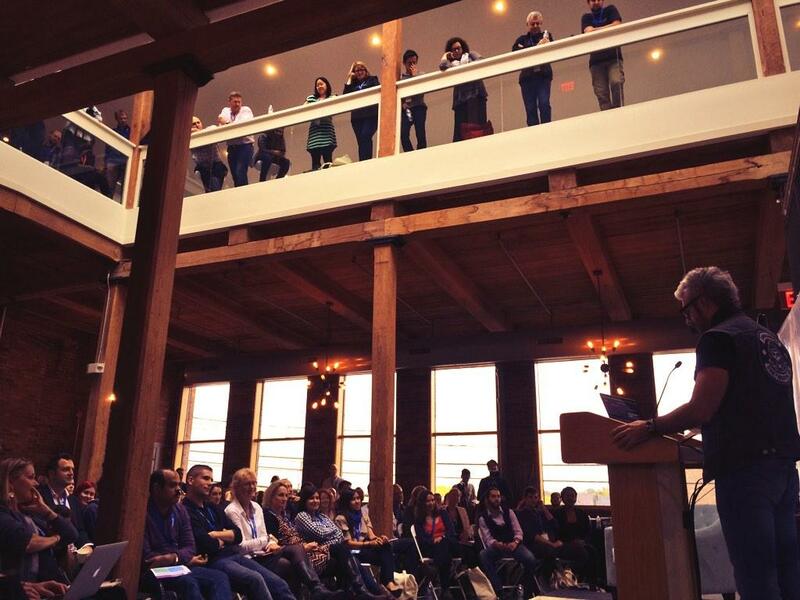 Here are ten things that will make UX Fest awesome (and why you should come)! Let’s just get this one out of the way quickly – $195 for an all-day event with speakers of this caliber (more on that later) in the Boston market is kind of ridiculous. I’ll probably hear about it on my next training ride with my boss (1:1 meetings on the bike or the running trail or just walking meetings are the best – seriously, do it!). Pricing events is always a tricky proposition. Too low (or free) and people tend to not be invested emotionally, let alone financially, in your event. If they wake up on the day of and look at their calendar, they may decide to punt on the learning experience and opt for the perception that they will get more accomplished slogging through their ToDo or meeting list. It’s free, after all. Price it too high, and you may exclude some people/companies with limited budgets for training and professional development. And rightly or wrongly, people associate some degree of value with your event based on the price. One final word on price – lately I’ve observed some conferences setting their price artificially high in order to offer huge discounts and promotions. I see a lot of “Early bird pricing ends this week – get your tickets for $500 off the list price! That’s over 80% off!” Really? Look, from day 1 we haven’t considered UX Fest to be about making money (again, I hear my Slack alerts going crazy). Sure, we’d like to cover our costs, but the value of UX Fest is more enduring than turning a small profit. The connections we make with one another, the inspiration we receive from our collective learning experience will pay itself forward. It always does. It’s exceedingly easy to get to and find – no struggling to find parking or battling downtown traffic. The conference space is intimate yet easy to get around in, which makes for a great learning environment. There’s a reason we’ve hosted well over 60 events here going back to 2012. It will be the last event we host at the gorgeous Riverworks space. It will be a fitting farewell to the space that has been our home for the last several years. For those of you who will be there, we’re excited to see you and celebrate together. This is our third go at UX Fest. And each time we’ve learned many things including that trying to do too many things degrades the experience. So being stewards of good UX, we collected some surveys and conducted interviews, we looked at the data, and we realized that running two or more (concurrent) tracks was something that we should not do again. The UX Fest program includes a single track and a single stage so nobody misses out on anything. Raise your hand if you’ve seen a lot of great panels where the moderator, topic, and panelists all crush it. I didn’t think so. You can assemble the most amazing panel filled with incredible industry luminaries who have incredible things to say. But put them together on stage, sitting in a high chair, with people they may not have met until that morning, and you are unlikely to get the results you were hoping for. The conversation can seem forced, people don’t know who is answering which question and in which order, and the moderator spends most of their time trying to keep the conversation engaging while not becoming the focus. Let’s fill those slots with inspiring and motivating speakers! Finally, if I never attend another 55 minute slide presentation followed by barely 5 minutes of Q&A it won’t be soon enough. Let alone a full day of them! There are probably a lot of reasons why TED Talks have become so popular, but one of them is their format. They are short. They are engaging. They are delivered by dynamic speakers in a dynamic way. Let’s have more of that and less Death by Powerpoint! Now about the people standing on that stage… Aside from settling on the date for UX Fest, this was the one thing that I worried about the most in the early days of planning. Who could we get that would be interesting, engaging, not to mention available to speak?! With but one week to go before kickoff, I can proudly and confidently say mission accomplished! Honestly, looking back on it, I never imagined we’d end up with such an outstanding lineup! Related to No. 4, we set out to not only assemble an amazing list of product and design leaders (mixed in with some engaging speakers with inspiring stories) but also to ensure we give diversity its due. Long after we finalized the list of speakers, I discovered the hasthtag #manel. There’s even a Facebook group called Manel Watch! But avoiding these lists are not reasons to assemble a diverse panel. The diversity of roles present at UX Fest gives us a new understanding of what UX means to different people and what it can be with a new perspective. It provides us with an opportunity to learn from one another and increases the likelihood of making beautiful products and experiences. And it’s not just about diversity of ethnicity, race, or gender. It’s also about diversity of role. The user experience isn’t just the designer’s responsibility. It doesn’t just live in a CEO’s hands. It lives in every single person and department as part of the culture of an organization. It’s in everyone’s hands to make everything really fantastic for the user. Everyone in the company owns the product experience, and its success or failure rests with each person who touches it. There are several reasons we are again hosting the event in our Watertown offices. Yes, it’s cheaper and easier (and our CFO certainly appreciates that). But it’s also intimate. We didn’t set out to host a blow-out event with 900+ attendees at a rooftop location in downtown Boston. We aren’t scanning barcodes on your name badge and entering you into our system to SPAM you with offers. Yes, you’ll be on our list of people to update about future events (most of you are already). And we have to know where to send the post-event learnings, summaries, pictures, and videos! And we’d love to continue the conversation with you in the future about all things product, design, and user experience. 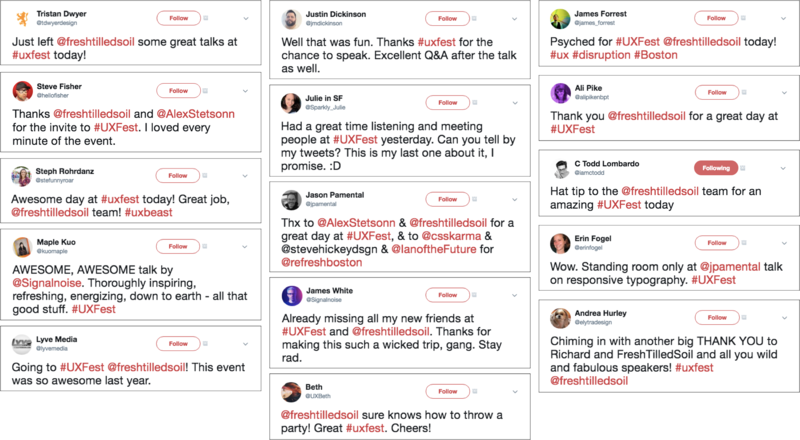 Ultimately, UX Fest is a gathering of people who care about customer experiences and making those experiences really good. It’s about learning from one another about how we are collectively solving the biggest product, organizational, and design challenges. 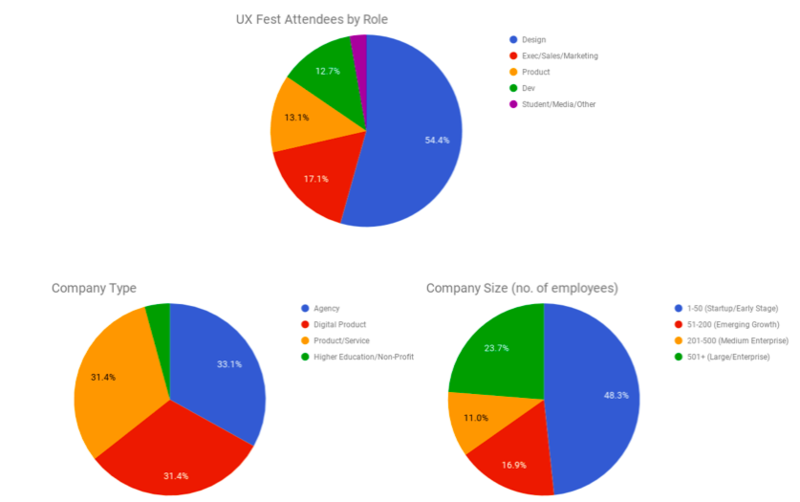 People from all roles within the product team attend UX Fest to get reinvigorated, to connect, and to have the one-on-one conversations that they don’t normally get to have at conferences. UX Fest attendees come to learn and share ideas with one another. If any one of these roles is under-represented our experience would be lessened by their absence. UX Fest will spark conversations as you share insights with your colleagues, mentors, and leaders you will want to follow long after the event ends. It’s incredibly valuable to involve the whole team in designing products and solutions. With their diverse skills, mindsets, and experiences it would be foolish not to. Everyone has a role, and every job is an inherently creative one, whether it’s obvious (designers) or not (engineers). Some of the best product solutions we have worked on at Fresh Tilled Soil have come from engineers who have such a good understanding of the problem space (thanks to a great product leader) and an inherent grasp of the opportunity afforded by the technology stack, that finding quick, elegant solutions to customer needs becomes second nature. We recognize that the most successful teams are cross-functional teams that can get close to the customer. UX Fest brings together all of these people from different disciplines (and sometimes independently-operating silos) within the organization to have a conversation about what’s important to their particular project, product, role, or business.